Why pay for a roof inspection when you can get it for free. We offer a fully comprehensive, 25 point roof inspection that will identify any weaknesses or issues which need to be addressed … FREE. Where else can you get this type of inspection for free? After a major hailstorm, many homeowners sigh a breath of relief as their home and vehicles look unscathed. 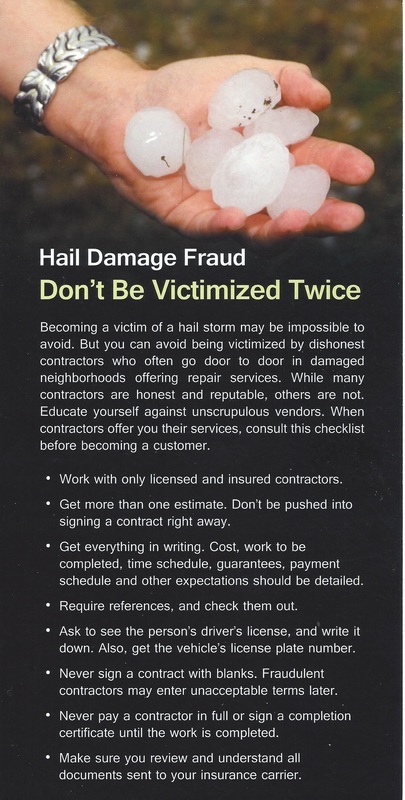 However, that sigh of relief could very well be “wishful thinking” as there could be underlying damage to their roof, siding, stucco, windows, deck, etc.. All too often, hail roof damage is not visible to the naked eye; but, the consequences of ignoring hail damage can be extremely costly. What they don’t see, could end up costing them thousands in repairs to their roof and the exterior of their home. Colorado Springs, Colorado can have hail from as early as April to mid-September. Unless you have a metal roof on your home or business, you probably won’t see much in the way of damage from a hailstorm. However, that doesn’t mean that the roof is undamaged. You see, hail is extremely destructive. Consider for a moment that hail can get as large as 4.5” in diameter, depending on the severity of the storm. Also, most hail travels around 60 to 80 MPH. What do you think happens when it meets your roof? 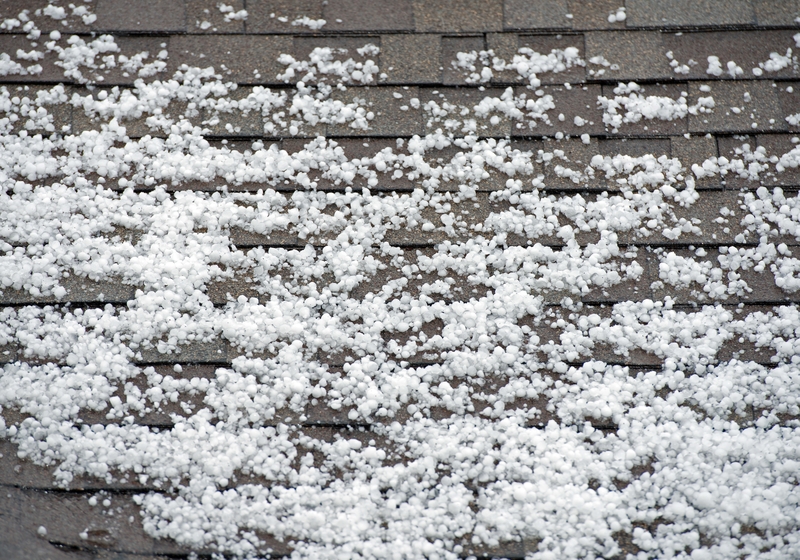 Roofs covered in shingles are most likely to hide damage from hail. The hail actually can chip away at the rock/pebbles on the shingles and expose the asphalt underneath. When this happens, the asphalt breaks down faster and can create small leaks. Of course, leaks can lead to wood rot, moldy insulation, mold on decking and even flooding if not corrected in a timely manner. What’s worse is that a home or business owner won’t know that there is damage to their roof unless they have an inspection done. It’s generally easier to see hail roof damage on metal roofs as they tend to bend/divot after being struck by hail. For most, the damage is merely cosmetic; however, there are cases where metal roofing still needs to be inspected after a hailstorm. At Restoration Colorado Roofing, we understand hail roof damage. 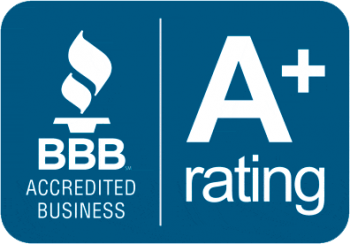 We have licensed certified, trained staff ready to help you whether you need an inspection, roof repair or a complete roof replacement. Our team has more than 50 years of roofing experience, ready to work for you. RCR offers roof hail damage insurance claim repair services to all our clients. 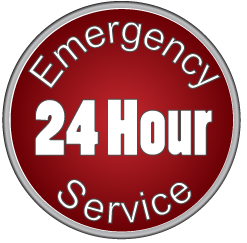 We work with insurance companies on a daily basis. 1. Verify and confirm with the local weather bureau that a hail event was recorded for your specific area. This information can lend significant credibility to your claim process with your insurance carrier. 2. The first hail damage indication will be any obvious damage to the field shingles, roof vents, flashings, and Hip & Ridge shingles. These items will generally exhibit the most evident damage. Impacts from hailstones will typically create depressions, dents and/or other obvious scarring to the various surfaces of the roof system components. 3. 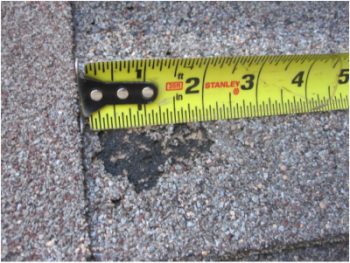 If any obvious hail damage is evident on the above items, a very thorough inspection of the field shingles is warranted. Inspect for the loss of, or loosening of, the 3M ceramic‐ coated granules on the shingles’ top surfaces. The impacting of the hailstones can loosen the adhesion of the granules to the coated asphalt substrate below and granules will gradually begin to loosen and fall off as a result – either immediately or in a few months. 4. Several shingles at random will need to be carefully raised to inspect for any rupturing of the back of the shingle substrate. Even if the top surface granules appear to be intact, there may be hidden rupturing of the shingle substrate. Virtually any rupturing of the fiberglass/asphalt substrate indicates a compromised life expectancy of the shingles and should be replaced. 5. 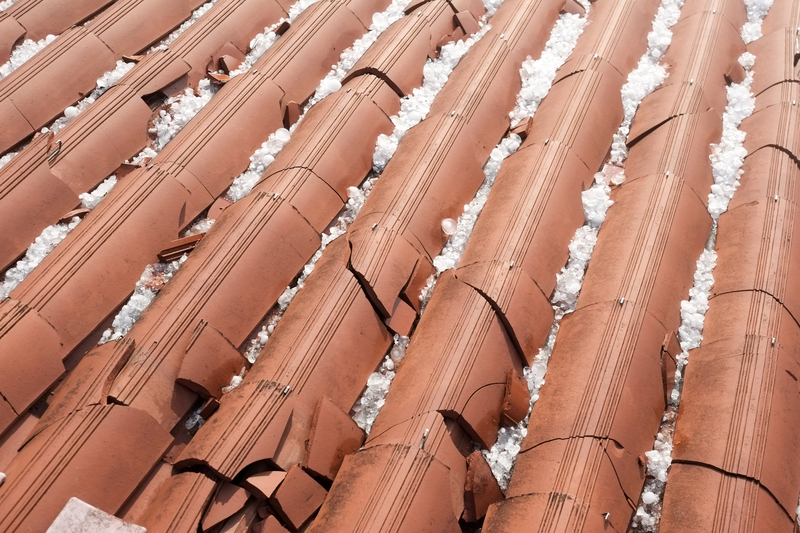 If damage is suspected, but not readily evident immediately after the hail event – take copious, dated, photos showing the condition and esthetics of the entire roof at that time. These photos can then be used as reference in the future if the damage manifests itself later. The damage may exhibit itself much later, due to the hail event and granule loss acceleration, which can cause obvious esthetic and physical damage to show up over time. 6. If damage is not indicated immediately after the storm, continue to monitor and document the field shingles, gutters and downspouts for excessive granule losses for several months. 7. In hail prone areas, consider installing replacement shingles classified by the UL 2218 testing protocol as Class 4, Impact Resistant.  These Class 4 rated asphalt shingles are designed to preclude most future impact damage. to withstand more impact abuse. The very nature of the SBS Modified asphalt coating ages much slower and retains the granules for much longer service life than standard asphalt coatings – even if the shingles never encounter hail. There are instances when an insurance settlement is received for hail damaged asphalt shingle and the roof is not replaced within a reasonable time after the damage occurs. The loss of the ceramic coated granules and/or ruptured shingle mat opens the entire assembly to accelerated weathering and very likely leakage into the finished interior of the structure. Literally “pocketing the settlement” will increase the actual costs of replacing the roof at a later date and diminishes the actual value of the structure. There is various type of flashings at your walls that we inspect during our 25-point inspection process. covering of your home and down over the material that is covering your roof. Flashing should continue to overlap over the material covering your roof. The important thing to note here is that there are no dimensions that are provided and that are applicable to every manufacturer, so every contractor will install it differently. The main goal is to make sure that water will be kept out of the headwall flashing. We will inspect the flashing and ensure that no water will be able to seep into it. Sidewall Flashing – this is the flashing that lies between a wall and a sloped portion of your roof if there is any. The only exception is if your walls are made of brick. The same function applies to this flashing, which is to keep water out. Step Flashing – this flashing primarily consists of installing small pieces of the flashing overlap every piece of shingle your roof contains and this is the kind of flashing that tends to be installed defectively. Regardless of the type of flashing that was used in the installation of your home, we at Restoration Colorado will inspect each kind thoroughly and make sure that it keeps water from leaking into your home.